Nope, this is not a story about Cat Steven’s famous song. It is a story about wine. When Michael and I decided to come back from London in order to join Michael’s parents winery it was all clear: We wanted to do it our own way. At this time it wasn’t so clear how this way would exactly look like. We just knew we wanted to work sustainably and make good quality wine without additives, no fining, no filtration. A good product which we would be proud to sell and love to drink. We started out as a “wine making project” always having in mind that there was a big chance we might fail. Meanwhile the production of conventional wine had to go on as we had employees to pay and clients to serve. And then in 2014 we bottled our first vintage and it went through the roof. Maybe it was sheer luck or 2013 was a good vintage – I don’t know. What I know is that we made many mistakes and were most of the time quite uncertain about what to do. 2014 was a really difficult vintage and we had to give up a lot of our wine. But what worked out worked out greatly. It still felt like a project though as we didn’t earn enough money to make a living. With the 2015 vintage the point had come where we had to decide if we wanted to seriously invest or not. We have chosen to take this path and make a lot more wine the way we like it. After three years it is the first time that it feels serious and real to me. I know it may sound cruel but I haven’t had trust in what we did throughout the whole time. I always said to myself that there was still an emergency exit. Interestingly I never had the feeling that Michael’s dad would have doubts. He and Michael had been working side by side, discussing, sometimes arguing, but always supporting each other. They both have the same mission: to save this little winery. Most of the time I am a bit overwhelmed by how much trust and respect they have for each other. Michael’s dad is obviously very proud of his son taking over this place with so much passion and interest in making wine. And Michael could not be prouder to have a father who is amazingly open and has so much trust in his son. It just feels natural that out of this relationship something has emerged that is as precious as the relationship itself: a new line of wines. But as both come from a very different angle – Michael is a true advocate of natural wine and his father is part of the appellation’s quality control committee – they needed to make some compromises. “Compromise” though is way too negatively connoted for what they made. The goal was to produce a couple of wines which would pass the quality test of the appellation. Optically clear, no funky flavors, stable. But still as natural as possible. The wines ferment spontaneously, go through malolactic fermentation as they like and remain on the full lees afterwards – just like our 2Naturkinder-wines. A light filtration takes place – if needed – just before bottling. And that’s where the sulfur comes in. With all wines having completed (malolactic) fermentation the danger of re-fermentation is pretty low. The first wines were bottled with as little as 25mg/l – and all of them passed the test. It might become a little more here and there but we were very excited to see that we can go pretty low. The basics are bottled, a Silvaner and a Müller-Thurgau, a few reds and a big Silvaner still have some time to develop in our old barrels. 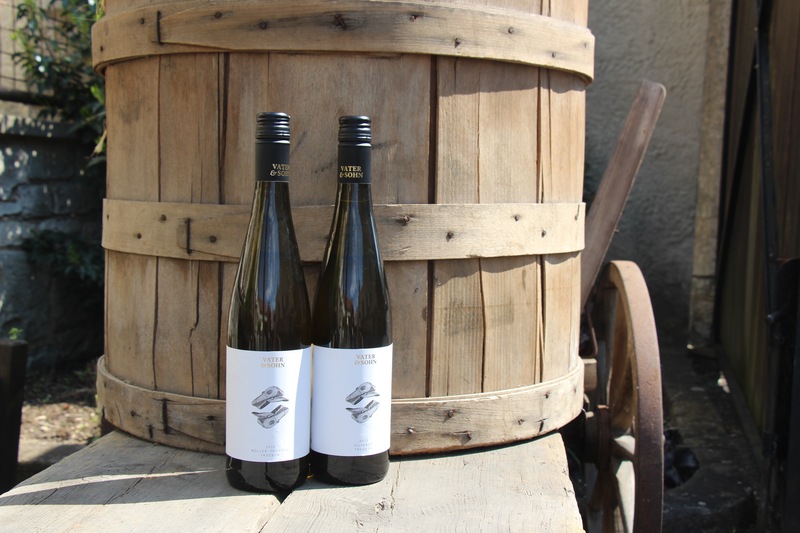 The Vater & Sohn wines close the gap between the past and the future of our winery. They reflect what is important to us: family, love and tradition. And they are a clear sign that this little project will keep growing. Thanks so much, for the wonderful design, Mati! You did an incredibly great job. If you want to see more of her work check out her Facebook page.